Flint, Michigan. Image from the New York Times. 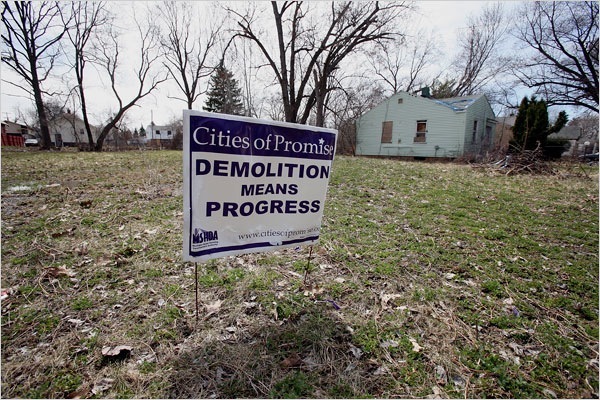 Across the rust belt, shrinking cities are asking themselves what to do about abandoned properties and the rapid rise of vacant lots, crime, neglect, and the high cost of providing infrastructure, both social and physical. Some cities are pursuing what they call “right-sizing,” acquiring and tearing down the empties, relocating the few remaining residents to neighborhoods that can be sustained at capacity, and turning the vacant lots into useable green space, urban gardens, and forests and parks. Detroit. Image by Alex MacLean. The poster child for this movement is probably Flint, Michigan, which has lost about half its population in the last 45 years. But similar programs are underway in Detroit, Youngstown, Cleveland, Minneapolis, Baltimore and many other places. 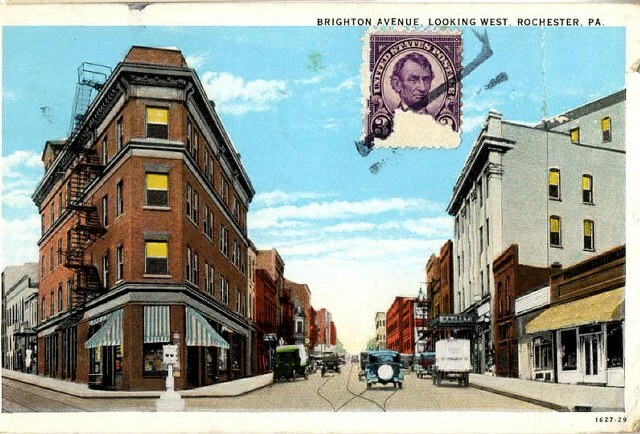 Cities you know well, like our own – Rochester. Let’s have a little talk about this. Last week I was fortunate to get an invitation to attend a half-day charrette at City Hall here. It turns out that three University of Rochester graduate students had a bright idea, and got the city to help them organize a gathering of 50 or so community leaders, and sustainability and urbanism types, to consider what is needed to create a greener Rochester. The students are currently transcribing the comments and suggestions (almost anything you can think of would help here – we’re not exactly on the leading edge of the next urbanism). But before the charrette began in earnest, there were presentations. One of the presenters was a knowledgeable and thoughtful city planner named Chuck Thomas. He is leading an initiative here for the City called Project Green. Sounds good – we need some kind of Project Green here really desperately. 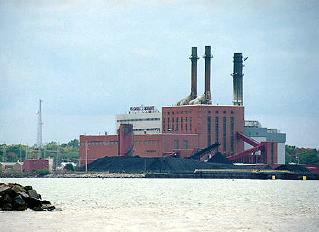 But it turns out that Project Green is Rochester’s tear-down program. This city has about 96,000 household units, and about 9,200 are vacant. The goal is to tear down about 3,000 of the vacant units over the next 20 years, at a cost of about $70 million. The target, we were told, is a vacancy rate of about 5%, instead of the current 10%. While Project Green is a demolition plan, it’s called Project Green because the idea is to make all the vacant lots green – as in parks and gardens. We don’t have the oceans of abandonment that cities like Detroit and Flint are struggling with, but we do have locations that have had teardowns, and various places in the city currently have plenty of vacant housing units. Here’s a look at the proposed demo on Wilkins, between Hudson and Joseph, in the northeast quadrant of Rochester. Wilkins is the very long block in the center of this image. 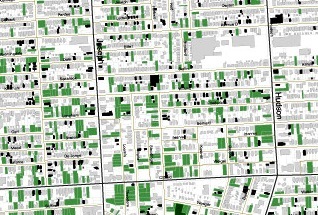 Green colored lots are already vacant, and black colored buildings are the demo targets. This block, almost half a mile long (!! – maybe a factor? 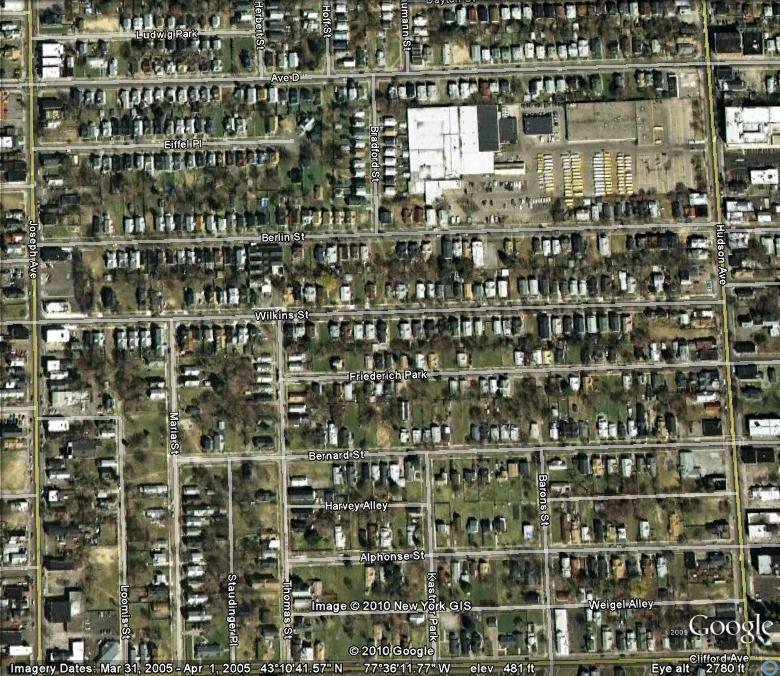 ), will lose about two-thirds of the buildings once sited there. Here’s a better view. There are a few other blocks like this one in the city, but most are blocks with only one or two empties scheduled for razing. The rationale for all this, Chuck told us, is that market conditions and continuing sprawl in the region, combined with a stable regional population and declining city population, suggest no future demand for these abandoned places. Said another way, we have the same number of people here in the region, just more and more spread out – ergo sprawl and a swooning city. Fair enough – we face the same dilemmas that trouble other older cities plagued with sprawl, and economic and social segregation. The neighbors who remain in many of these neighborhoods face a host of ills – crime, drugs, fires, health and safety issues, and others, and they need several kinds of help. But I wonder if demolition is the right approach. Market conditions – that phrase troubles me. If we are basing our assessment of the need to reduce the housing count on current market conditions, we should probably just tear down the city. Rochester has sky-high taxes, depressed home values, dwindling services – all the usual contemporary urban ailments. Real estate does eventually sell here, but it usually takes quite a while. And think of how happy our suburban neighbors would be – tearing down the city would free up a lot of cash for even more sprawl. But what if market conditions change? Like what happens if, for example, gas goes to a much higher price? Or say, to a somewhat higher price. Which seems highly likely soon, and inevitable in the long run. Will this inspire folks to move into the city, to be closer to work and play? Will this fact alter existing patterns of retail, away from the malls and toward neighborhood options? What we have here is greening by lowering density – tearing down the city to meet supposed market conditions while wrecking valuable existing assets. Isn’t this just plain wasteful, and a bit dim? Maybe I am whistling in the dark here, but I do know that greening by demolition lowers density, and makes providing transit options even more problematic, as Ron Kilcoyne, CEO of Greater Bridgeport Transit, said recently. And not just transit. Greening by lowering density makes providing all kinds of social and physical infrastructure more difficult. Fewer homes means less taxes, and less tax revenue means fewer cops and firemen and libraries and teachers and…. It’s a long list. So what if we didn’t and couldn’t sprawl anymore? What if we realized that we absolutely cannot sustain the region’s sprawl – economically, environmentally, you pick? 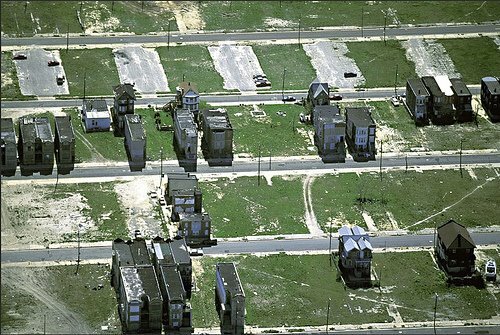 What if we realized that we can no longer pay to maintain and operate what we have, much less allow even higher taxes caused by the cost of increased sprawl? What if the market told us we needed to move away from a world shaped and driven (so to speak) by cars? What if only half of the dire predictions scientist’s offer for our environment come true? What if we really finally understood that our contemporary patterns of urban and regional living are absolutely and completely obsolete? What if we realized that living in a dense urban setting actually begins to solve some of our problems? Would we begin to wonder why we started tearing down the city? Well, not actually from the road. We’re back home, and as is usual on road trips, events got in the way of actually continuing the story while out and about. But I do want to share some of our observations. So: onward. Day 2 saw us travel from Erie, PA south to our destination, Monaca, PA, north of Pittsburgh. Amy’s parents are from this vicinity, and our event was near here, so we made camp in the late afternoon, settling in for a couple of days. 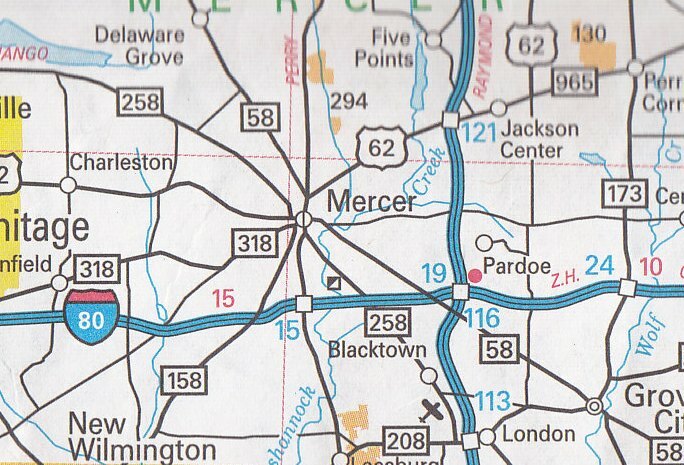 On the way south from Erie, we lunched in Mercer, the county seat of Mercer County. The blinking red traffic signals notwithstanding, it was nice to see all of the monuments and memorials on the grounds of the county seat. 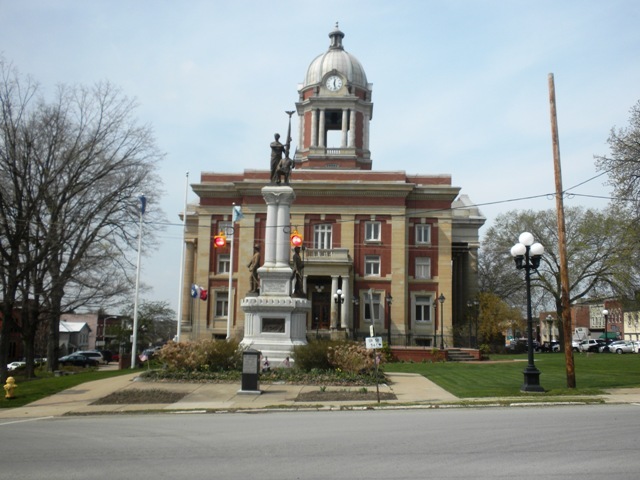 These various place markers suggest that this square and its building are still an important presence in the lives and memories of county residents. We often take these kinds of places for granted, but they are nonetheless freighted with the symbols of our common life as a community. And here’s something else we found interesting about Mercer. 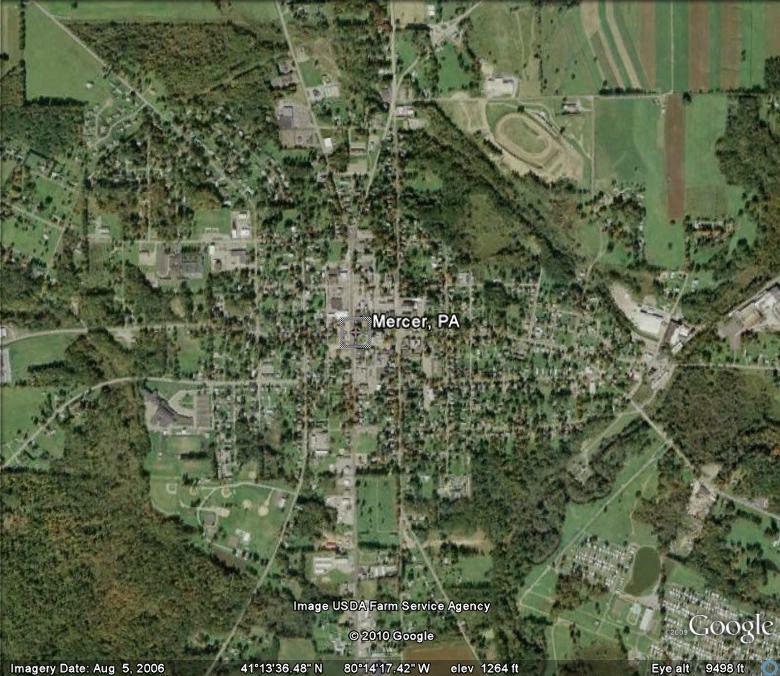 Mercer, PA, from Google Earth. Something like 10 roads all converge on the center of town from across the countryside. Interesting. We didn’t have time to find out much about the town’s past, but what we found did get us wondering about how it came to be such a center of activity. If you consult your road maps, you won’t find many places that look quite like this. And what are those running in the middle of Brighton Avenue? Streetcar tracks? Again?? Ack! Steel, railroads, Joe Namath, and more steel were once at home in this place. 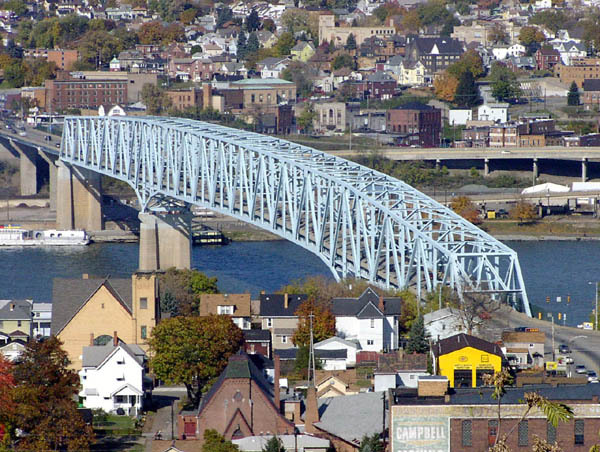 The towns are Beaver and Monaca and Aliquippa and Conway. Not so long ago, daylight was twilight – the air was so filled with pollution. Amy’s mother used to tell us of changing clothes four and five times a day because they got so dirty from the soot and filth in the air. Pretty rough places, in more ways than one. Sorry Pittsburgh fans, but we decided to spend our free time on this trip looking at these towns, and trying to understand what they were, what they have become, and what might lie ahead. 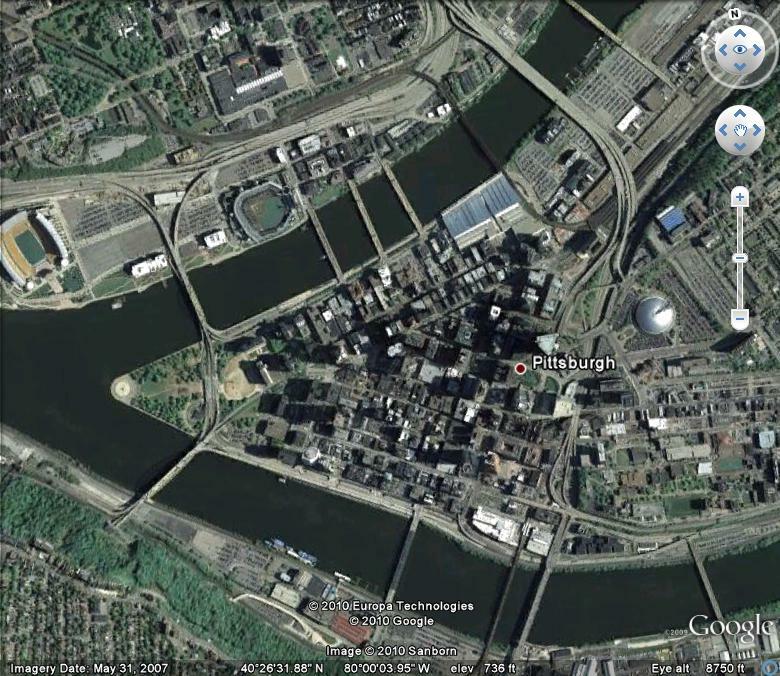 We both do love Pittsburgh – it’s a terrific place. But we found ourselves engaged by the profound changes north of the city, and interested to think about the challenges these smaller communities face. As ever, onward. 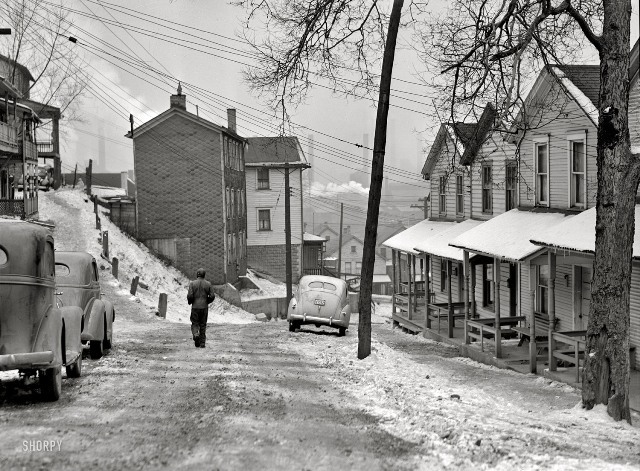 Photo by Jack Delano, from a favorite website, Shorpy. Here’s another view by the amazingly gifted Jack Delano, also found at Shorpy. (You might want to take some time and learn more about Jack Delano – he was a remarkable man). And today? Gone. All gone. Jobs gone, most heavy industry gone, most pollution gone. Families gone. Retail gone – sacked by the shopping mall on the hilltop in Monaca. Every little town has much that is empty, abandoned, falling down. 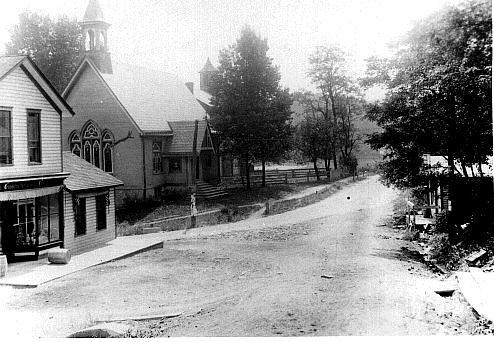 Brighton Avenue, in Rochester, PA. Photo by dougules, on Panoramio. Hard to tell what’s next. Clearly these places today are not sustainable, in any real sense of the word. They have changed quickly, and could change quickly again. But…. But into what will these places change? Is there enough capital, will power, insight, civic loyalty, ambition, hope, and imagination to convert these towns once more? We found ourselves wondering about these questions over and over on this trip. In Dunkirk, Erie, Mercer, Rochester, Aliquippa. 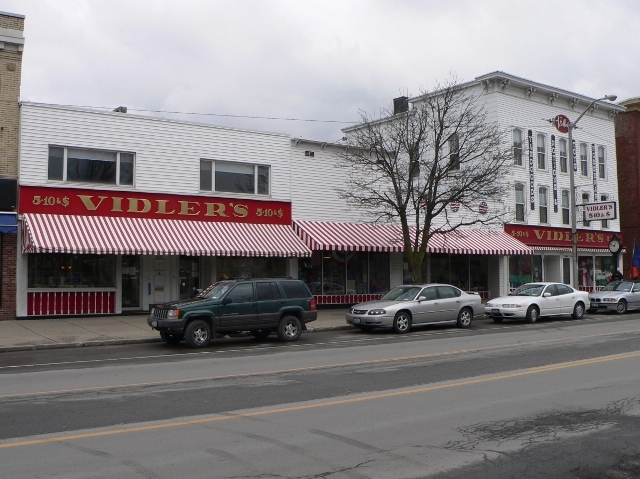 And on the return trip home, in Meadville, Jamestown, Olean (Olean – how badly damaged by the 20th century – so sad). And on our final leg, from Olean home, through Arcade and Attica and Batavia. Even the tiniest hamlets look hurt, pained. Each of these smaller places has so much in common. They have all been badly damaged by cars. Big box retail has killed the town centers. Junk and abandonment is everywhere amid the dwindling populations. We make no mistake here – we are not being nostalgic. These places have never been Edens. Life in these places has never been easy, or tidy, or carefree. In fact life has always been a huge struggle in these places, as it is now, and certainly will be in the future. But what there was once that is now gone is a kind of coherence, a kind of clarity to these places. Centers of activity where now there is only vapor. People gathering, where now we are all driving away, or around, or by. A willingness to stick, where now there is an emptying out. 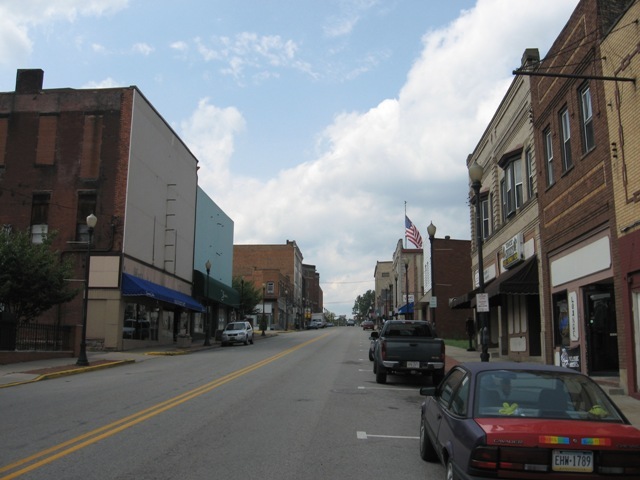 A kind of consensus about what town life looked like and felt like, where now we have too many cars, crapitecture, strip shopping, fast food, and interstates. Progress is a funny thing – will we ever agree on what it is? We’re on our way to Pittsburgh for a family event, and a chance to look around. Here’s a look at what we’re seeing, and a bit of what we’re thinking, as we go. Day 1 began with a drive to Erie, PA. We strolled along, first south and then west, across the state. On country roads – I can no longer bring myself to drive expressways. Of course, we could barely keep driving because the noise was so deafening. Ear splitting. Just kidding. But the locals aren’t – noise concerns are a part of their legal strategy to stop turbines here, and elsewhere in the state. 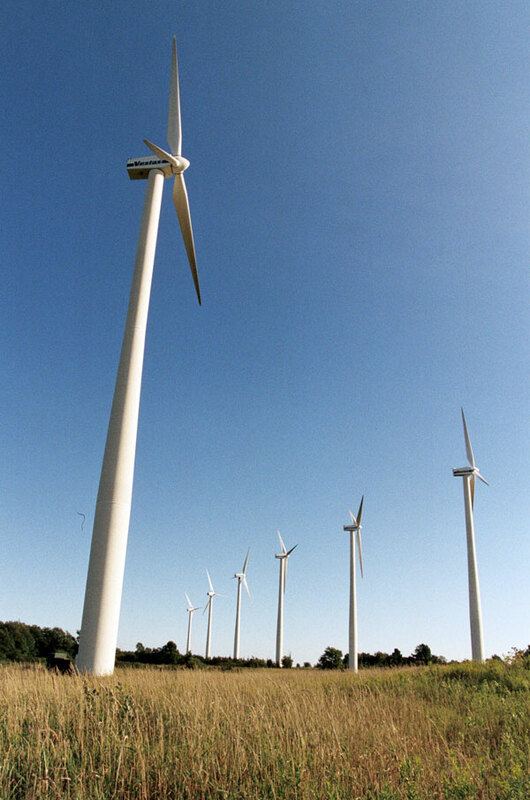 NY state ranks about 9th in wind generation, despite the critics. Photo by reisende54 on flickr. And Elbert Hubbard’s Roycroft community, an Arts & Crafts era mecca, and definitely worth a visit. The Roycroft Inn remains a true wonder. Then a long and windy drive along the south shore of Lake Erie, to Erie, Pa. Along the way, we stopped in scenic Dunkirk to stretch our legs, and admire the fabulous coal-fired power plant which obliterates the Lake’s edge. And then we arrived, near “rush hour,” in Erie. Perry Square, downtown and named after the Commodore, is a lovely two block stretch, and the old library enfronting the square is strong and dignified. A very nice civic space, all the zooming cars and trucks notwithstanding. 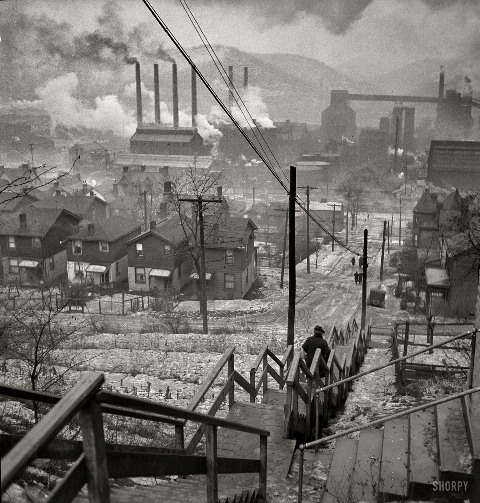 Unfortunately, the disappearance of heavy industry, and the substantial ravages of autodom, has done lots of damage to what must once have been a nice, though heavily polluted, city. Waldameer Park survives, and the roller coasters loom above the roadways and bluffs as you near the lake. You can look it up. 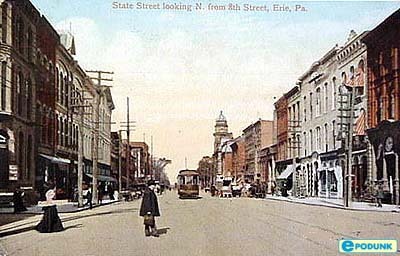 In Erie, as in many cities we visit, we find ourselves weighing the price a city pays for becoming a specialist, as against remaining a self-sustaining place. 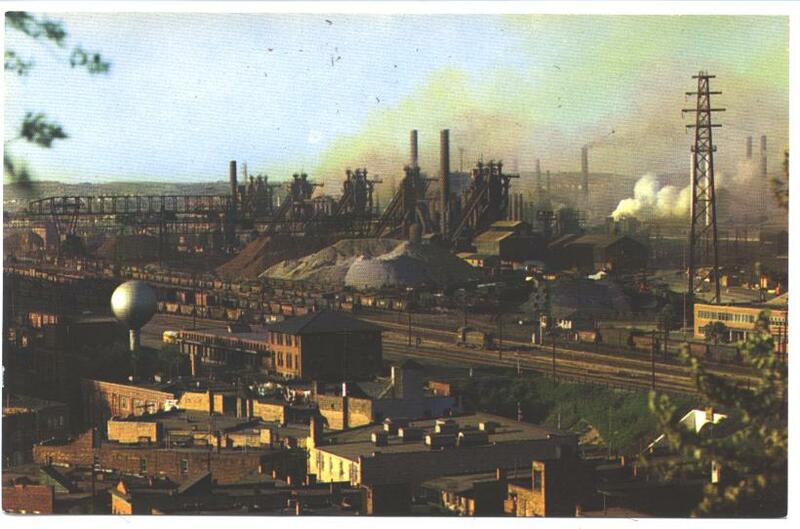 In Erie’s case, heavy industry, now mostly gone, was the specialty. Now the community, with its specialized skills and jobs and attitudes and habits of thinking and living, must find new ways to sustain itself. Steep climb, we think. More about the tour in a bit – off for some chow. We’re off to Pittsburgh for a few days of snooping around. Feel free to sit a spell while we’re on the road.